I want you to know, brothers and sisters, that the gospel preached by me is not of human origin. For I did not receive it from a human being, nor was I taught it, but it came through a revelation of Jesus Christ. For you heard of my former way of life in Judaism, how I persecuted the church of God beyond measure and tried to destroy it, and progressed in Judaism beyond many of my contemporaries among my race, since I was even more a zealot for my ancestral traditions. But when God, who from my mother’s womb had set me apart and called me through his grace, was pleased to reveal his Son to me, so that I might proclaim him to the Gentiles, I did not immediately consult flesh and blood, nor did I go up to Jerusalem to those who were apostles before me; rather, I went into Arabia and then returned to Damascus. Then after three years I went up to Jerusalem to confer with Cephas and remained with him for fifteen days. But I did not see any other of the apostles, only James the brother of the Lord. Jesus journeyed to a city called Nain, and his disciples and a large crowd accompanied him. As he drew near to the gate of the city, a man who had died was being carried out, the only son of his mother, and she was a widow. A large crowd from the city was with her. When the Lord saw her, he was moved with pity for her and said to her, “Do not weep.” He stepped forward and touched the coffin; at this the bearers halted, and he said, “Young man, I tell you, arise!” The dead man sat up and began to speak, and Jesus gave him to his mother. Fear seized them all, and they glorified God, exclaiming, “A great prophet has arisen in our midst, ” and “God has visited his people.”This report about him spread through the whole of Judea and in all the surrounding region. I'm sure that all of you here wants to have a beautiful relationship, whether with your family, with your friends, office mates, or with someone special. Do you have it - that beautiful relationship? My dear friends, our readings today - the First Reading, the Gospel, and as sang beautifully in the Responsorial Psalm, speak of that beautiful relationship between God and man. That is, man's total dependence on God's compassion. In the First Reading, we have the widow, the poorest, the helpless in the Hebrew community. The life of her son is already beyond her control. She simply entrusted the life of her dead son to the hand of God, through the prophet Elijah. The same thing happened to our widow in our Gospel. What happened? We see here the image of a widow doing what she can to help herself, but still she had total dependence on God's compassion, fully trusting that God will take care of her child. She had no complaints. The dead son in the Gospel could be our own experience of difficulties. In the most difficult moment of our lives, what do we usually do? Do we have the attitude of the widow? I am not pessimistic, but just a reality check in our lives. It is ironic that we profess our faith in God, especially when we attend the mass, and trust in His providence and compassion, yet we devote much of our time aiming and saving for the future. It is not bad, but it becomes that, when we forget that we will not even live long enough to see the future. We become too self-absorbed and worried, that we keep everything to ourselves, forgetting to be compassionate to others. My point is about dependence on God's compassion and, after experiencing His compassion, we should also be compassionate to others. But the question is - how do we show this? Tama bang wala na tayong gagawin? I remember, when we were building the church in our parish. My parish is one of the simplest apostolic chapels, and a beneficiary of Greenbelt Chapel's love-a-parish program. My friend and I came to a point when we had nothing left. We both have spent all our personal money to see through the completion of the church. Kasi mahirap po 'yong mga tao. Di po nila kaya ang pagpapagawa ng church. Wala na po silang makain, wala na silang bigas. So we, literally, had nothing left, that we prayed we won't be needing cash within the week. And we were certain that God will take care of us, just like what He does with the birds and lilies of the fields. That is dependence. 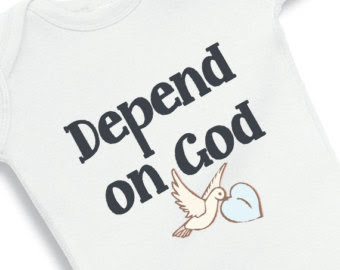 Dependence on God for us, then, means using our wealth, our skills and talents, our time and treasure, to serve God, to love God, to build His church, and save as many souls as we can, to win souls to the Good Father, because that Father is the only one who can assure us of the future. It is our Father in Heaven who will take care of what we do. He will give more than what we need, as He will never be surpassed in generosity. Just like what the widow experienced in our readings. Why does the Lord teach us to be dependent on Him? Is someone who feels and thinks he is self-sufficient, and who is proud and powerful, capable of experiencing God's compassion? What do you think? No. If someone feels that he is self-sufficient, and is proud, he cannot, or he will not even want to try to look in order to experience the compassion of God. Therefore, that someone will also not be capable of being compassionate to others. Ganoon lang 'yon. Just imagine this scenario. If all of us, Christians, think that we are self-sufficient and relying only on our own strength, what a lonely world this would be. Bakit po? No one gives compassion, because no one experiences it. So the helpless and the least remain miserable, and so are those who think that they are capable, because they, too, remain empty and lonely despite their material possessions. But in practicing charity and showing compassion to others in the name of God, after experiencing the blessings and the compassion of God in their lives, magiging masaya ang mga tao. My dear friends, dependence on God is an expression of our trust in Him, and our willingness to receive His love and compassion. It is in our littleness, no matter what we are and who we are, that we truly experience God, if we come to Him in all humility and dependence. Remember - He is the only who can secure our future. And if we accumulate only all these material things for our future, remember...you may not live long before you can enjoy the things that you gathered for your future. Like the widow in our Readings, let us entrust ourselves to the Father, and ask Him the grace to experience His compassion, so that by experiencing the compassion of God, we can show compassion to others and we can find true joy in our hearts. And because of our presence, the people around us can say, "God has visited us". Amen.